As parents, we often catch ourselves doing or saying things that we wouldn’t want repeated by our kids. It’s okay — we’ve all been there, and we’d be kidding ourselves if we said we’ve never made mistakes. Even though we are human and slip up sometimes, it’s still very important to watch what we say and do in front of our kids. The reality is that they are incredibly impressionable during early childhood, and they look up to us as an example of how to behave at home, in friend groups, at school, and in other learning spaces. At The Apple Tree Private School in Houston, our early childhood education teachers believe that a parent’s behavior has a major influence on their child’s development, whether for good or bad. We see it in our own classrooms, as kids engage with one another and display certain behaviors with regard to sharing, cleaning up, language, manners, motor skills, and other important social and developmental milestones on a daily basis. It is our job to facilitate classroom engagement and learning when parents are not present, making it vital that kids have a good example to follow at home. We are extremely proud of our children, and they impress us every day with the behaviors and skills they are learning at home. Parents face an immense pressure to be the perfect role model for their kids, and you have all done an amazing job with your kids — it shows! Here’s why that extra effort matters. As previously mentioned, kids are very impressionable during early childhood, meaning that they pick up on every little thing you do in their presence. If you drop something heavy on your foot and let out a swear word, for example, your child might mimic that response to pain the next time they hurt themself. This is much harder to reverse than it is to prevent, given that kids don’t always understand that parents also make mistakes. To them, you are a living guide for how to behave in every situation life throws their way, and they tend to replicate your behavior in those moments unless corrected. Most often, however, these learned behaviors aren’t so obviously detrimental; it could be something as mindless and fleeting as wiping your hands on your shirt after eating a bright orange Cheeto or forgetting to wash your hands after using the restroom. While these micro behaviors might not be intentional or even cross your mind when they happen, your child will likely notice. It all comes down to making sure your behaviors are intentional — even the small ones. It might be difficult at first, and this is especially true for new parents. But the good news is that you won’t have to walk on eggshells for long, because you too will internalize good behaviors and automatically shift gears when you are around your kids. All it takes is a basic understanding of your child as moldable, and forming your behaviors accordingly so they reflect your intentions as a God-driven parent. How Do I Become A Better Role Model For My Kids? Now that we’ve discussed why it’s important to be a good role model for your kids, take a second to reflect on some of those moments when you slipped up in front of your kids. Think about the situation and what triggered your behavior. Whether you let out a swear word, had bad manners at the dinner table, or did something else you wouldn’t want your child to do, the first step toward intentionally avoiding these behaviors in the future is to identify how they happened. If your automatic response to pain is yelling or swearing, develop a predetermined plan of action for the next time it happens so you don’t pass along those responses to your child when they witness your behavior. If you speak with food in your mouth at the table and notice your child doing it, make a point to correct your habit before scolding them. At this point in their life, it is critical for you to lead by example so that you aren’t hypocritical when it comes to disciplining your child. You don’t want to sacrifice these valuable teaching moments by confusing, hurting, or angering your child when they don’t know better than to copy your every move. Sounds easy, right? Not so much. Many parents have a hard time adjusting their behavior for the sake of their kids, and part of the reason is because it requires a great deal of honest self-reflection. If you find that you are having a hard time identifying and correcting your bad habits and don’t know where else to turn, turn to God. He knows exactly what you’re going through and will stand by you every step of the way — especially when you feel like a lousy parent. He will help you realize that your genuine effort to become a better parent makes you just that. 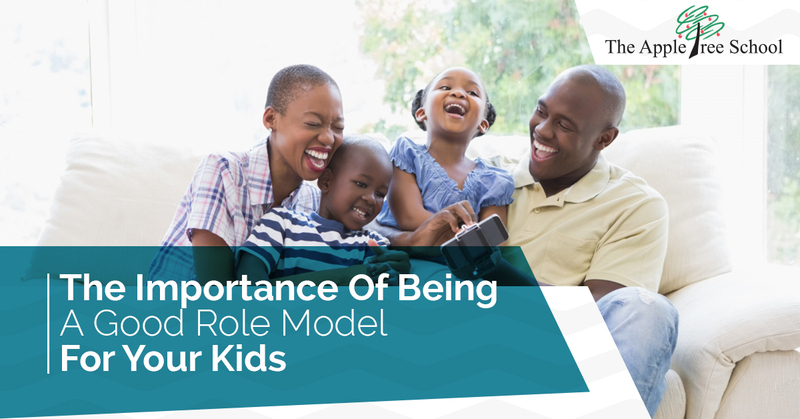 We hope that this has given you a little insight about why it’s important to be a good role model for your kids, and that you will return for more tips and helpful information in future blog posts. We take great pride in the development of our students, and we’d like to thank you for all the work you put in at home. If you’re reading this post to learn more about our philosophy as a Christian early childhood education center, get to know us and enroll your kids at The Apple Tree Private School in Houston today!